All over the blogosphere I have been seeing vintage bathing suits and I'm in love! There is just something so cute and classy about high-waisted bikini bottoms, polka dots and frills. 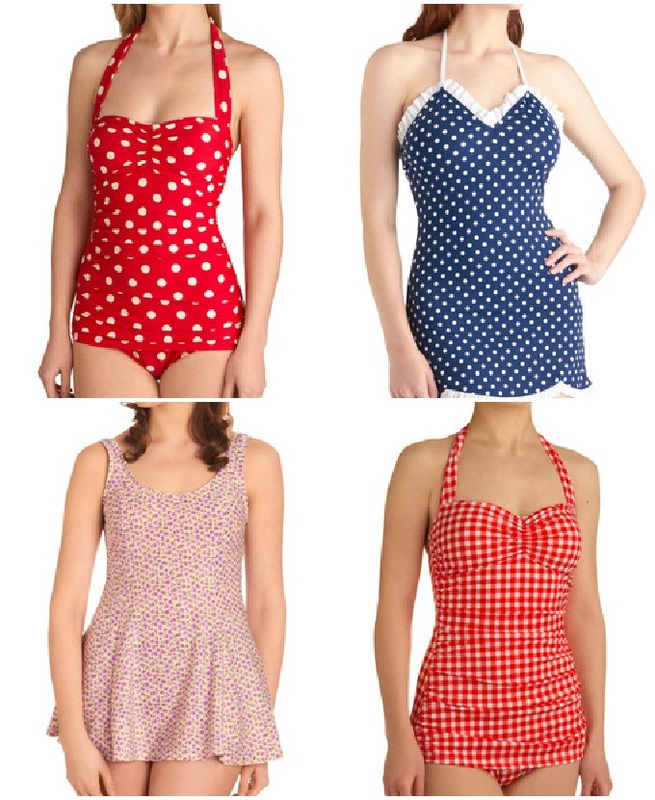 I just purchased my first bikini of the summer, but I unfortunately couldn't find an affordable (around $30) vintage inspired swimsuit so I made a wishlist of my favorite modcloth swimsuits. Which are your favorites? Also, I put together the perfect boardwalk outfit after spending a day on the beach! Couldn't you just imagine walking around in this outfit looking at the cute little shops located by the ocean side? I adore vintage style bathing suits! They are so cute and flattering for every shape! I love that boardwalk outfit! And I bet that polka dot one piece is so flattering. I've been enjoying this trend too! I like the gingham one and the striped one of the ones you collected. So sweet looking. I love vintage inspired suits! the dotty ones are the bestest ones! I love the red striped bikini, so cute! Love the vintage looks. So classic! My kind of style! I am now following you! I love vintage-style swimsuits too! They've been on my wishlist for a while now, along with mint skinnies and these cute pants from Primark. Hi chelsea, i loved, loved vinatge style!!!! They all look supercute! They look really nice, but I don't think I could pull them off. love your blog! i'm now a new follower! :) thanks for the lovely comment in my blog! Lovely! I love the black one! I LOVE this kind of bikinis and high wasted bottoms, especially the last polyvore collage (black one) in your post. But I don't have a clue where I could get these since I haven't seen there anywhere yet except the WWW but I don't like to order things. Could you suggest me another option? Xoxo Plus, would you mind checking out my blog as well? I love these vintage inspired pieces, especially the high waisted bikini bottoms! ahhh i love vintage bathing suits. i think they're so cute and they're more interesting to look at than, say, a thong one haha. they're so much more feminine! love all of these pieces, makes me miss summer! it's dreary winter here in Australia! wow these are all so gorgeous! I especially love the polka dot ones! I like the black spotted one piece you have in your vintage beach look image, where is it from?